We were really pleased with our intro movie for Shadowhand, which plays to set the scene and outline plot at the beginning of the game. In RPGs it’s customary to level up regularly, gaining points to spend on customising your character, boosting and tailoring their abilities to suit your preferred playing style. 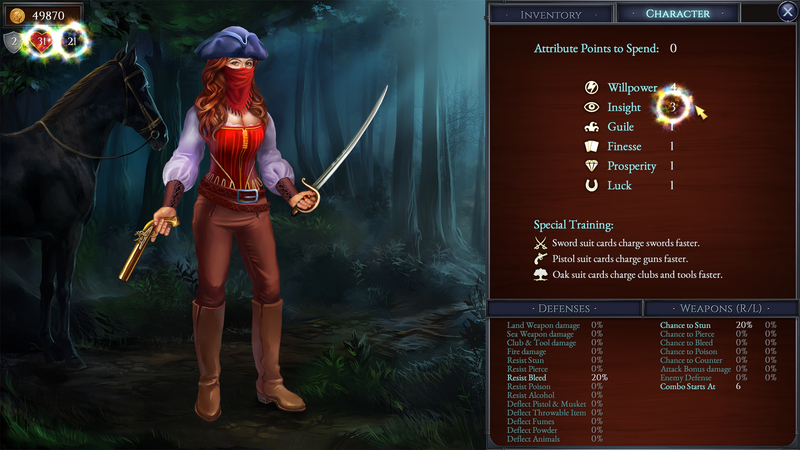 For Shadowhand, we had a choice of coming up with stats that affected the player’s combat, like most RPGs do, or using stats which affected the card play only. Since weapons & outfits affect combat, we decided that it would be nice if character stats only affect card play. This would make the game stand out from other RPGs; plus card play stats are universal in that they affect both puzzle and fight levels. Our previous game, Regency Solitaire, had a lot of shop items that affected card gameplay. Some of those items lent themselves well to the kind of stat that you can increment by a small percentage each time, e.g. 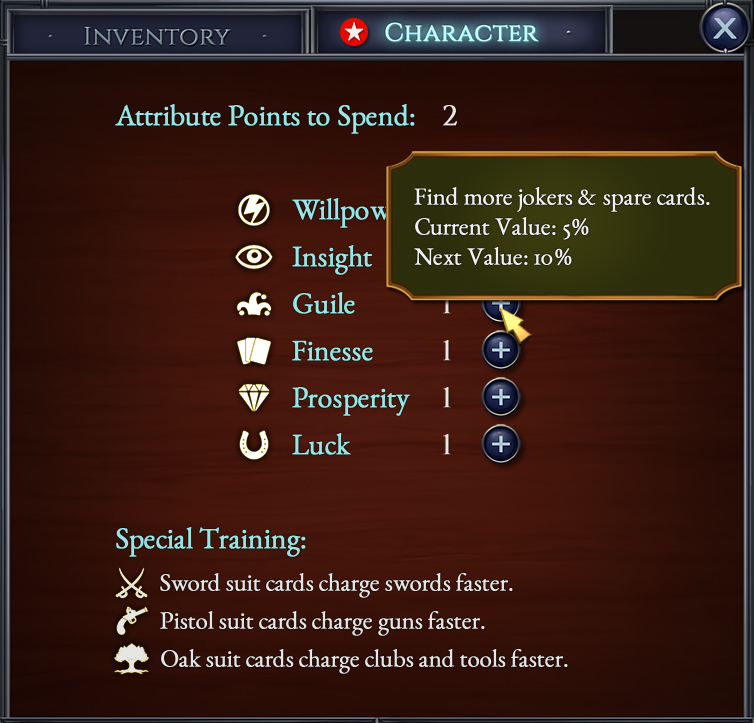 the number of cards face up at the start of a hand or increased chance to find jokers, wild cards, etc. We have expanded on this in Shadowhand with stats such as luck, which means you find better loot, and finesse, where you “finesse” the stock pile to bring a favourable card to the top. Willpower: Charges Active Abilities faster. Insight: Start hand with cards face up. Guile: Find more jokers & spare cards. Finesse: Cheat! Draw better stock cards. Luck: Find more gear in loot. These stats need careful balancing and testing using our own automated test system that we spent a long time developing, to make sure none of them is over- or under-powered. There are six stats to which you can allocate up to ten points each although some of them let you go slightly above ten if you chose to wear a special outfit item. The game will give you 40 points to allocate, this allows some level of customization for different players, depending on what they find important. You are currently browsing the Grey Alien Games weblog archives	for April, 2017.